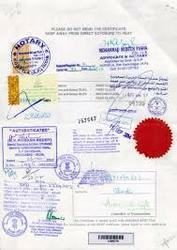 Provided by us are Post Degree Certificate Attestation Services to the esteemed customers. The Post Degree/Post Graduation Certificates need to be attested when one needs to go abroad to receive higher education. In case, if our client needs to present the certificate in the country which is not a member of Hague Convention then it needs to be attested from corresponding Embassy of that particular country. Our organisation completes all the processes of attesting these certificates, even if the certificate holder is not present in the issuing country. Looking for Education Certificate Attestation ?